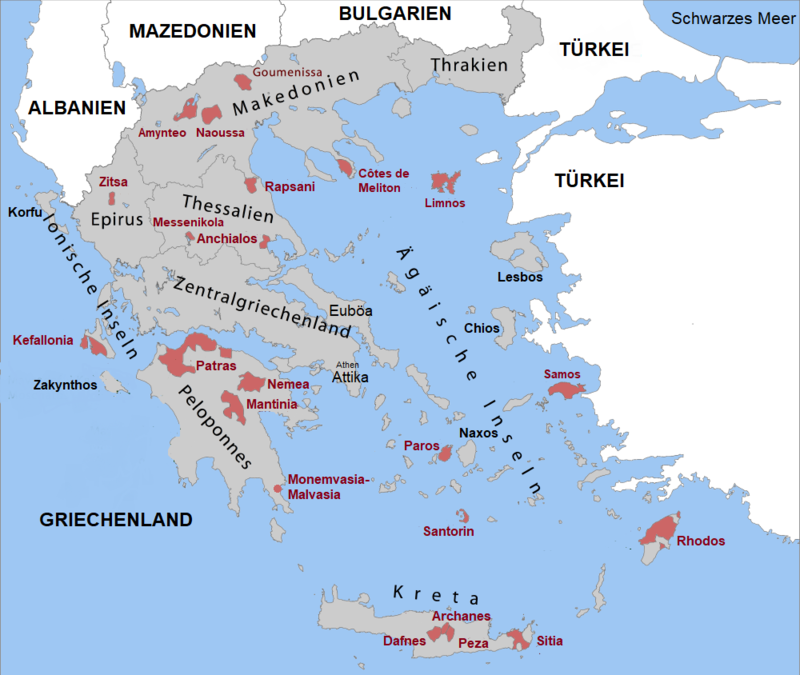 Ancient Macedonia (Macedonia, Makedonia) on the northwest edge of the Aegean was a kingdom in northern Greece and rose to great power under King Philip II (359-336 BC). This dominated almost the entire Balkan Peninsula. His son Alexander the Great (356-323 BC) served Macedonia only as a basis for his military campaigns. The Macedonian kings were known for their drinking and Alexander was allegedly killed during a drinking spree. In 167 BC, the empire collapsed and came under Roman rule. In the division of the Roman Empire in 395 the province was defeated to the Byzantine Empire. After varied history, the area was between Greece, Serbia and Bulgaria in 1913 and 1947 between Greece and Yugoslavia divided up. The largest with 34,000 square kilometers, the Greek region of Macedonia with the three-peninsula Chalkidike (with the famous monk mountain Ágion Óros on Athos ) and the capital Thessaloniki is ideal for viticulture. The climate is fundamentally different from other Greek wine regions. The most important red wines are Xinomavro (Main variety of the region), Cabernet Sauvignon. Merlot and Syrah, the most important white varieties Roditis. Assyrtiko. Malagousia. Chardonnay and Sauvignon Blanc, There are four as POP classified appellations, that is Amynteo. Côtes de Meliton. Goumenissa and Naoussa, In Macedonia, the three major producers Boutari. Carras and Tsantali Vineyards or wineries. This page was last modified at 4 April 2019 at 09:13.